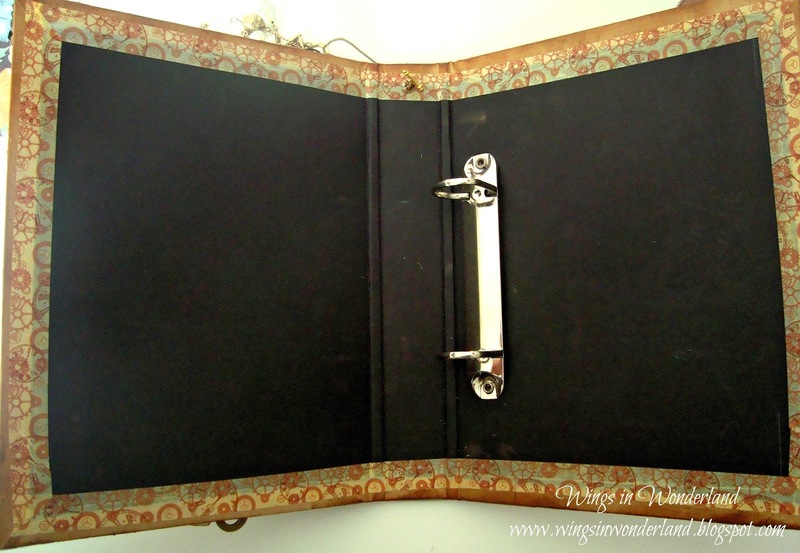 This week I want to show you all an organizer I created out of a file folder which I cut down to just above A5 size, wrapped in brown paper inked and then embellished. To create a journal feel, I ran some grunge paper through a clock embossing folder and then using Distress inks and glimmer mists came up with this leather looking binding. 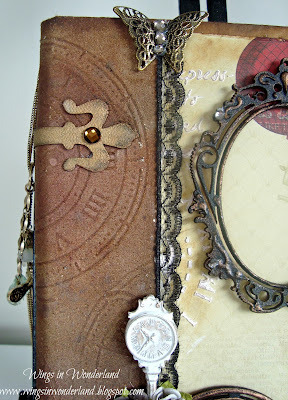 I absolutely love grunge paper it smells like real leather and takes inks and mists so well, I also used it for my hinges which were cut with the Tim Holtz Hardware findings die and embellished with Prima crystals. In the center is one of the Kaisercraft Wooden Frames which I have jazzed up by adding some details in puff paint, then once dry I painted the piece with acrylic paint and used my metalic rubon to highlight the raised areas. 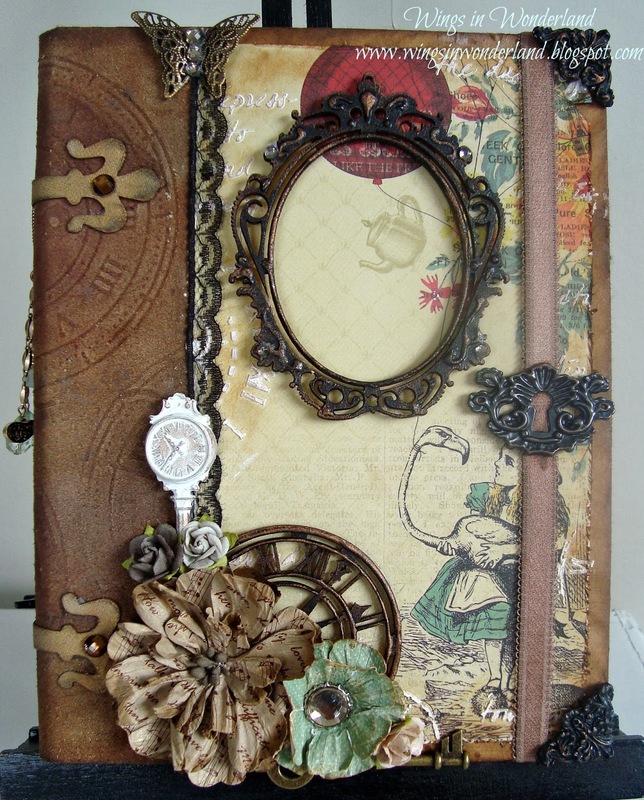 Later on I may add a picture of my family or maybe print off my blog name to place in here, its fully functional so I can change my mind what will go in here. 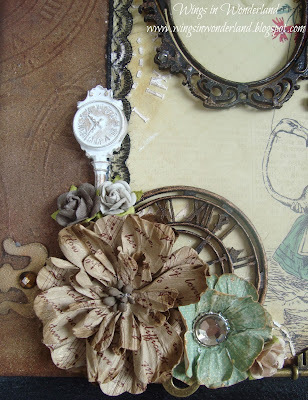 Also behind the frame you maybe able to see a bit of script and some clocks that have been added using texture paste through a Crafters Workshop template, these are fabulous and I used two different stencils for this project. 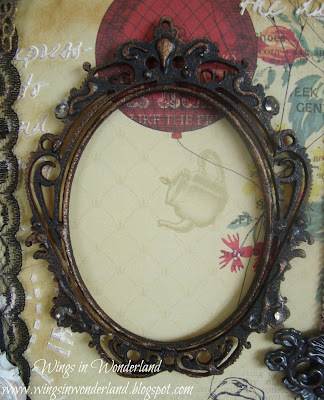 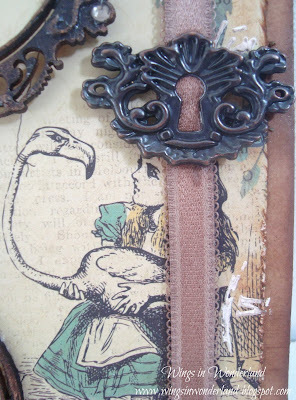 The closure of this album is a piece of elasticated ribbon that I have misted and attached a Tim Holtz Keyhole to, You can also see here the gorgeous image of Alice from The Kaisercraft looking glass collection, this piece that I have used for the Album is called Tweedle Dum. Because I plan on carrying this organizer around with me I kept the foliage to a minimum and just embellished with a Large script flower from my stash and used some of the 6.5 x6.5 paper from the collection to create the smaller green flower, then I Just added in a few Prima Lakeside roses, A Prima resin clock from last months kit and a Prima Key tucked in underneath and another Resin Piece for the two corner pieces (not in this photo), I also used part of a Kaisercraft clock which got the same treatment as the frame. Here is a quick look at the inside of the album which I have secured/decorated with Washi tape.